Enjoy battles with six stellar bosses in this hand-drawn adventure through Norse mythology. April is the month for Norse gods. 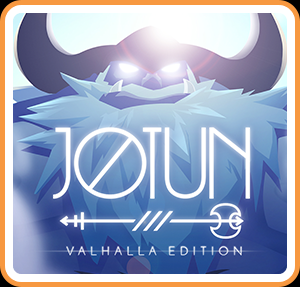 While PlayStation fans celebrate God of War, Switch owners get their own slice of Viking mythology in Jotun: Valhalla Edition, which debuted on PC in 2015 and came subsequently to WiiU, PS4, and Xbox One. It's a fun action title with terrific boss battles and ravishing hand-drawn art. You'll control Thora, a viking warrior who dies ingloriously. Resurrected in Ginnungagap, the primordial void, she must defeat five jotun (elemental giants) to gain entry to Valhalla. There isn't a lot of storytelling in Jotun. Upon defeating a giant, players will get brief insights into Thora's life before her untimely death, but that's about it. Where the game excels is world-building and tone-setting. From the hub world Ginnungagap, Thora will visit five otherworldly realms, each dripping in atmosphere. Every realm and every jotun receives a brief introduction, which identifies its place in Norse mythology. During the adventure you'll climb the roots of the cosmological tree Yggdrasil, learn the origins of the frost giants, and visit the forge that birthed Thor's hammer Mjölnir. All this is brought to life courtesy of Jotun's gorgeous hand-drawn art. Together with Sundered, Thunder Lotus Games has proven itself one of the premier studios in frame-by-frame animation — a technique that's sadly becoming a lost art. Artistic merits notwithstanding, Jotun succeeds because it's so enjoyable to play. Before each encounter with a jotun, Thora will explore up to two sub-areas. Filled with hazards, secret areas, and, rarely, enemies, these exploration segments scratch the itch for adventure, and provide a few power-ups for those willing to find them. Hidden trees grow Ithunn's Apples, which extend permanently Thora's health, and obscured totems provide one of several godly powers, for example Heimdall's Shield, which can turn the tide against a formidable jotun. While the puzzles and enemy encounters in these sub-areas are satisfying, never do they provide any exceptional thrills. Mostly, they serve as foreplay for the game's true purpose: boss fights. Jotun boasts six bosses in total, and each is a gem. There's Hagalaz, the storm jotun — one of the most difficult — who mid-way through battle splits into two and strikes at Thora with lightning bolts. There's Kaunan, the fire jotun, who uses his red-hot sword to summon burning cracks in the floor, and his tremendous mass to crush Thora. Players must study the movements, patterns, and tells of each jotun to survive. Winning in Jotun is all about knowing when to attack, when to position yourself for a future attack, and when to run. To accommodate fights with these hulking colossi, Thunder Lotus designed a complementary combat system — one with slow, deliberate strokes. On paper, Thora has a limited repertoire of moves; she can attack weakly, attack strongly, dodge, or summon a godly power. In action against powerful jotun, these moves — and the narrow attack windows that come with them — become much more complicated. Every showdown with a giant is a chess match in a way, featuring a series of bluffs, gambits, and sacrifices. Should you finish the game, and still crave more action with the game's stellar assortment of giants, you can try out Valhalla Mode. A boss rush mode, Valhalla offers up opportunities for speed runners, and anyone looking to topple every jotun without using any god powers or taking any damage. Clocking in at around five to seven hours, Jotun is a relatively short adventure — and its exploration segments, while good, don't live up to the game's collection of elemental bosses — but the package overall is strong. It's rich in atmosphere, visually stunning, and filled with some extraordinary boss battles. It's a nice addition to the growing library of indie games on Switch, and an ideal way to celebrate this month of Norse gods and monsters. This review is based on a digital copy of Jotun: Valhalla Edition for the NS, provided by the publisher.